A recent decision has been made to retire Raindrops on roses (High Chaparral X Lets Get Famous). A decendent of Let’s Elope, this six year old mare won over $151,000 in prize money placing frequently at races in town with her best distance being between 2000m to 2500m. Her future will now be here at Lauriston Park as a broodmare, we look forward to her progeny. Our recent up and coming stayer, sired by our very own Desert King and out of the Scenic mare Aythreeeighty, Negasi is looking very promising with two starts under his belt. Both times hitting the line extremely well. 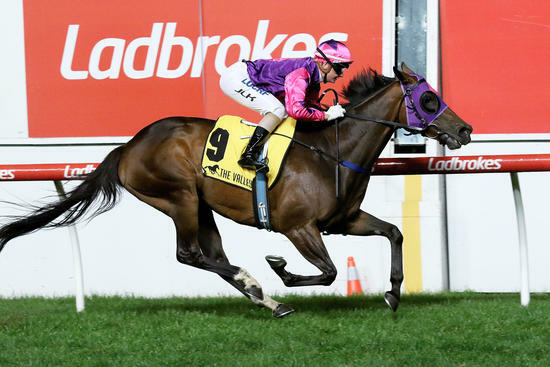 Negasi is nominated for a 2060m race at Cranbourne on Friday. After some set backs with his feet the Written Tycoon/Aythreeeighty gelding is now back in work at Lindsay park. We are eager to see what his future will hold and hope its similar to Richmonds! Gem Hunter a Turffontein/Gem of Gems, three year old is a half brother to group one winner Precious Gem. He is currently in work at Lindsay Park, with his first start tonight at Racing.com park. Honey Suckle Choice a Choisir/Bee’s Honey two year old filly at Greg Eurell is set to debut soon. With great trials, we look forward to her stepping out in the coming weeks. Currently enjoying her spell here at Lauriston, Lady Horseowner (Equiano X Kid Gloves) has a prize pool of $160,250 from only three starts with her most notable run in the Blue Diamond. We are expecting her to return to work around the middle of May. A three year old bay filly by Lucas Cranach out of Desert Bride, is currently in training with Pat Carey and is progressing very nicely. Bee Wanted (Wanted X Bees Honey) is currently in training at Lindsay Park and had a promising jump out recently. Bee Wanted is booked for a trial in the coming weeks. After a great jump out in training at Lindsay Park, All that she wants (Wanted x Sunday Mist) will be having a trial in the coming weeks.